A super group of musicians who, in less than a week, produced a song to say no to racism: this is the miracle of the song “Gente Do Sud”. Last March, during the visit to Naples of Italian Northern League leader Matteo Salvini, the musician Massimo Jovine decided to protest against anti – immigration idea with the power of music, the song Gente do Sud is about the South people attitude of acceptance migrants and refugees. 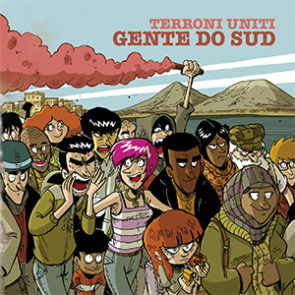 “Gente Do Sud” was a working progress song that took shape while artists, collaborations and contributions added to the group “Terroni Uniti” formed by Thirty musicians ranging from the big names of history of Neapolitan music to new generation musicians. Terroni Uniti are: Massimo Jovine (99 Posse), Ciccio Merolla, Enzo Gragnaniello, James Senese, O’ Zulu’ (99 Posse), Eugenio Bennato, Speaker Cenzou, Valentina Stella, Daniele Sepe, Franco Ricciardi, Dario Sansone (Foja), Valerio Jovine, M’Barka Ben Taleb, Pepp-Oh, Francesco Di Bella, Simona Boo, Tommaso Primo, Andrea Tartaglia, Tueff, Gnut, Nto’, Roberto Colella (La Maschera), Dope One, Gianni Simioli, Carmine D’Aniello (‘O Rom), Oyoshe, Djarah Akan, Joe Petrosino, Massimo De Vita, Giuseppe Spinelli, Alessandro Aspide (Jovine), Sacha Ricci (99 Posse). The visit of Matteo Salvini in Naples was only an excuse to light the creative fire of artists who live, sing and play in the shadow of Vesuvius. “Gente do Sud” is not a hate song against League leader. The song is a hymn of love, an invitation to acceptance that talks about solidarity and brotherhood. The Mediterranean has always been a crossroads of history and culture, Naples itself is a happy multiracial city. The differences between people is a true power. Videoclip of the song “gente do sud” directed by Luciano Filangieri, shows the mood of artists while recording the song. The donations we will collect on OpenDDB will be donated to the Alarm Phone of Watch The Med, created in October 2014 by activist networks and civil society delegates in Europe and Northern Africa. The project created a direct phone line for refugees in troubles in the Mediterranean Sea.